All eyes will be on Apple’s keynote at the annual Worldwide Developers Conference in San Francisco on Monday, when Steve Jobs & co. are widely expected to (finally) unwrap a new service that’ll stream all your music from the vaunted “cloud.” What else will Apple have up its sleeves? Read on for my predictions. Lifting its usual veil of silence, Apple went ahead and told the world earlier this week that it would take the wraps off a new “cloud services offering,” dubbed iCloud, during Monday morning’s keynote. Naturally, it didn’t take long for insiders and various anonymous sources to fill in the blanks. In a nutshell, word is that iCloud will be a relaunch of MobileMe, Apple’s subscription-based online service that lets you store files in a cloud-based disk drive (called “iDisk”) and sync your email, contacts, calendars, and photos across all your Macs, iPhones, and iPads. The new iCloud service, the rumormongers claim, will add music streaming to the mix, complete with a utility that scans the tunes on your hard drive and instantly mirrors all your songs on a remote server (via a technique called “scan and match”). Your mirrored tunes would then be available for instant streaming to any PC, Mac, iPhone or iPad, provided you’ve got a Net connection. Pretty cool, but most predict that iCloud music streaming will eventually cost you—perhaps to the tune of $25 a year, although Apple may initially offer the service for free. Still, that would be a bargain compared the current $99 annual subscription fee for the existing MobileMe service. Prediction: iCloud music streaming is pretty much a lock, although it’s not clear when it’ll actually launch (this fall, I’m guessing) or how much it’ll cost (my bet: free for the first year). Another not-so-secret project that Apple’s been working on is the latest version of the Mac destop operating system. Code-named “Lion” (and following in the footsteps of “Snow Leopard,” “Tiger,” and “Panther”), Mac OS X 10.7 is slated to arrive sometime this summer. Many of its new features take their cues from the iPad, including a full-screen app launcher with pages you can “swipe” with your mouse, the iPhone’s famous “pinching” gesture, a new mail application that a kissing cousin’s to the iPad’s, and a “resume” feature that saves the state of your apps before you close them (in the spirit of app multitasking behavior on Apple’s iOS devices). That’s what we know; what we don’t know is exactly when Mac OS X “Lion” will hit stores, and whether it’ll mark (as rumored) the first major Mac OS update available via download on the Mac App Store. Prediction: I’ll go out on a limb and guess that Apple’s “Lion” will roar onto the Mac App Store on Monday, the day of the keynote. Little is known for sure about the next big revision to Apple’s mobile platform for the iPhone, iPad, and iPod Touch; indeed, the only official word on iOS 5 is that it’ll be demonstrated on Monday. The buzz, however, is that the new OS will boast a completely revamped system for notifying users of incoming alerts and messages—something beyond the blunt, intrusive pop-ups that appear when you get a text or a calendar alarm goes off. There’s also chatter that iOS 5 will offer “deep” integration with Twitter (something beyond mere photo sharing, apparently) and full-on voice commands. 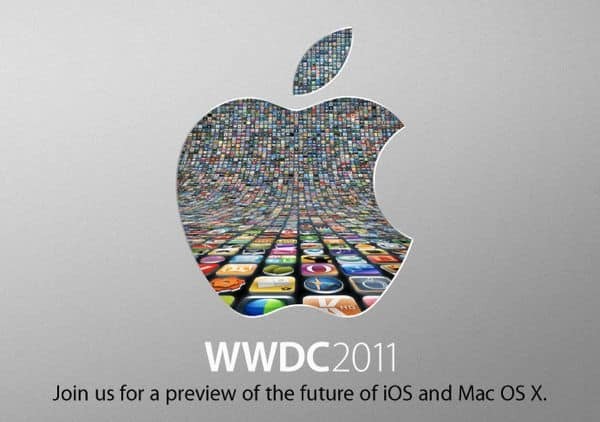 If all that sounds pretty vague, well…it is, and it’s not clear how much of the iOS 5 speculation is real and how much is just wishful thinking. Prediction: I’ll put my money on improved notifications and voice commands for the revamped iOS, with a release date sometime in the fall. Apple has unveiled a new iPhone during its past few WWDC conferences, but the prevailing wisdom is that it won’t happen this year. Instead, think September, say those in the know, who believe the upcoming iPhone “4S” will boast a speedier dual-core processor (similar to the one in the iPad 2), an improved camera, and a design that’s virtually identital to the iPhone 4. Prediction: Monday’s keynote will (sadly) come and go without a new iPhone, but hey—good things come to those who wait. Eagle-eyed Mac bloggers have been noticing that supplies of Apple’s Time Capsules, which wirelessly back up your Mac’s hard drive to a built-in backup drive, have been running low—usually a sign that an update is in the offing. Indeed, 9 to 5 Mac says it’s heard that a new Time Capsule will boast the ability to regularly tap Apple’s servers for any new software updates and download them automatically, allowing users to quickly install them rather than having to wait for a potentially lengthy download. Another possibility, according to the blog, is that the updated Time Capsule might store your most oft-used iCloud files to speed up any buffering delays. Interesting. Prediction: It sure sounds like a new Time Capsule is immanent, but I’m not feeling all that confident about what new features are in store. Your guess is as good as mine. So, what are you hoping to see unveiled during Monday’s keynote? Apple’s “iCloud”: Which features will be free, and which won’t? Would you pay to stream your own music from Apple’s (rumored) “iCloud”?